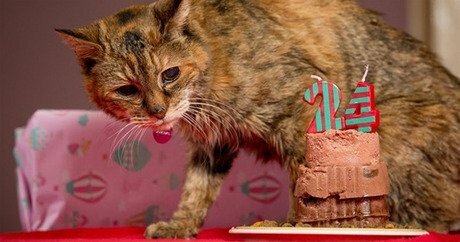 A tortoiseshell cat from the United Kingdom has taken the cake for the oldest living cat in the world. The Guinness Book of World Records recognized Poppy for making that milestone after the death of the previous world record holder, a 23-year-old Kansas cat named Pinky. Poppy, from Bournemouth, England, was born in February 1990, making her 24-years-old this year. Translated into human years, Poppy is 114-years-old, two years younger than the oldest living human being, Misao Okawa of Japan. She may be blind, deaf, and a bit frail now in her advanced age, but Poppy is still kicking, says her owner, Jacqui West. “People always ask what we put Poppy’s longevity down to and I guess she has a good diet and lots of exercise,” West tells the Daily Echo. But it isn’t all boring health food for Poppy, West admits. “She is partial to the odd takeaway,” Poppy’s owner explains. Poppy is known for enjoying biscuits, kebabs, fish and chips, and even KFC chicken on occasion. Poppy has been in Jacqui West’s family for many years. She and her mother, Marguerite Corner, adopted Poppy when she was 5-years-old. Then, when Poppy turned 10, she moved in with West and her future husband Andy. Since then, Poppy has been a mainstay as the couple welcomed two sons, 11-year-old Joe and 8-year-old Toby, as well as four other cats, two rabbits, and even a hamster, according to the Daily Mail. West says she and her family adore Poppy and are thrilled she has received recognition from Guinness. Poppy has certainly reached an impressive age, but 24 is nothing compared to Crème Puff. According to Guinness, Crème Puff was born on August 3, 1967 and lived a whopping confirmed 38 years with her owner, Jake Perry, in Austin, Texas. Crème Puff passed away on August 6, 2005. Perry also owned another shockingly old cat — Sphynx cat Granpa Rexs Allen lived 34 years and 2 months before passing away in 1998. And though her exact birthdate could never be confirmed, Lucy, a cat from South Wales was believed to reach the amazing age of 39 in 2011.